What a day it was last Saturday. Suanne and I never had three big events happening on the same day. By the end of the day, I was totally exhausted. The day started with a family event in the morning. He he he … many of you know that I hardly slept the night before. That’s me … a worry-wart. I was running the plans for Saturday in my mind over and over again … checking and rechecking the list again. In the afternoon, the TV crew came to do an interview with Suanne and I. I was hardly prepared for the TV because I was just too engrossed with the big dinner in the evening. I hope we look good on TV and I don’t end up saying the goofiest thing on TV. The show is a short documentary on chowtimes and food blogging. The program will air in summer. That’s all I can say for now. 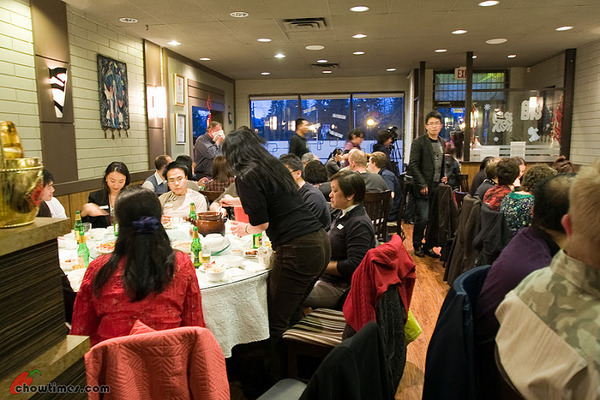 The BIG event of that Saturday was the first in the series of dinners which we dubbed as the Eight Great Traditions of Chinese Cuisine (8GTCC). So the first dinner in the 8GTCC series is focused on the Hunan cuisine. 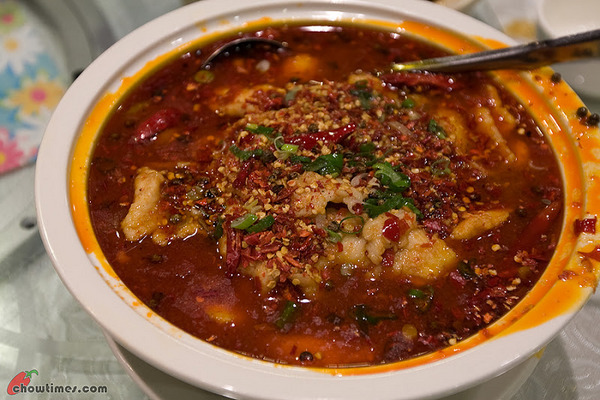 The 8GTCC team call this a fiery start as Hunan cuisine is known for its spiciness. The response for the event was overwhelming … 52 people attended. It was unfortunate we had to turn quite a number of people away because we totally misjudged the response. We had initially planned for 40 people. When the invitation went out, we surpassed that 40 number within two days. I was quite panicky and at one point I suggested that we take over the entire restaurant. Ivy, the owner, was not in favour of that idea but I understand. Alvin Garden is a popular restaurant and she did not want to turn away all her regular customers on a busy Saturday night. So we landed with 52 people. The dinner was held in Alvin Garden. 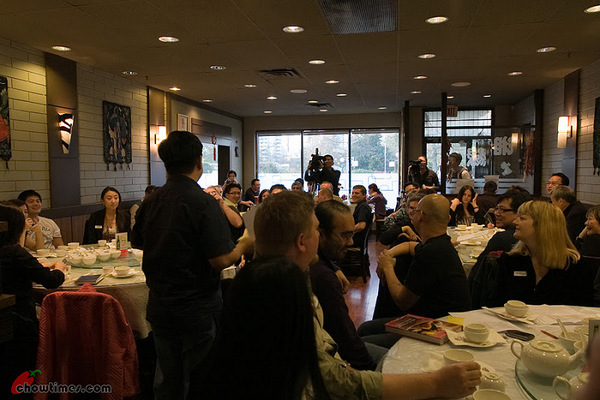 The timing of the 8GTCC Hunan dinner could not have been better. 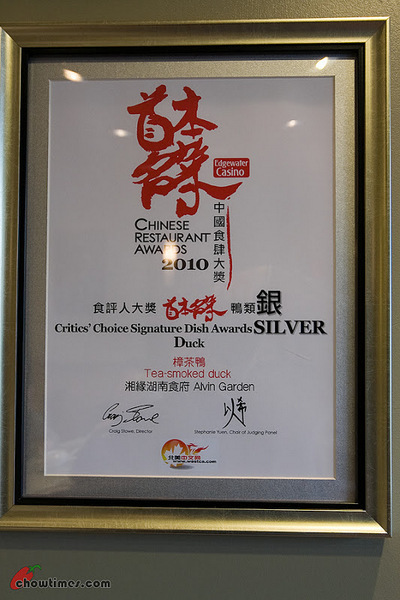 It was just days before our dinner that Alvin Garden won two prizes from the coveted Chinese Restaurant Awards in the duck and appetizer categories. The 8GTCC team tweaked the menu a few times. 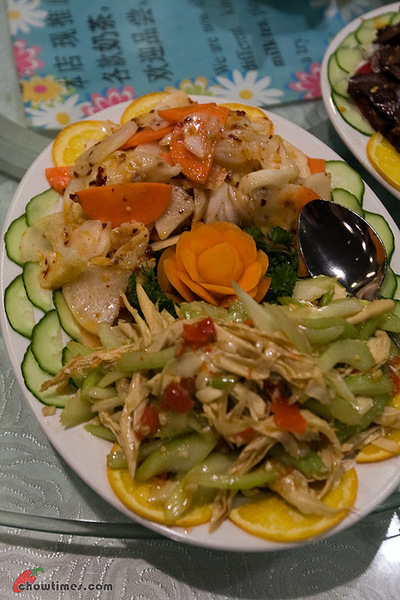 We started off with identifying 10 dishes and two appetizers as representative dishes of the Hunan cuisine. It then became 12 dishes and 2 appetizers. 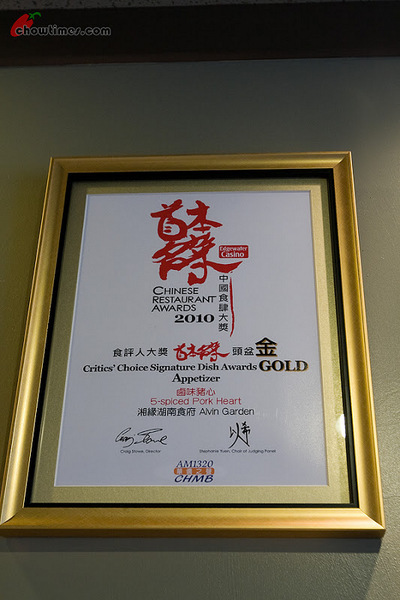 When we saw the awards above and after discussing with Ivy (the owner of Alvin Garden), it became 14 dishes and 4 appetizers! 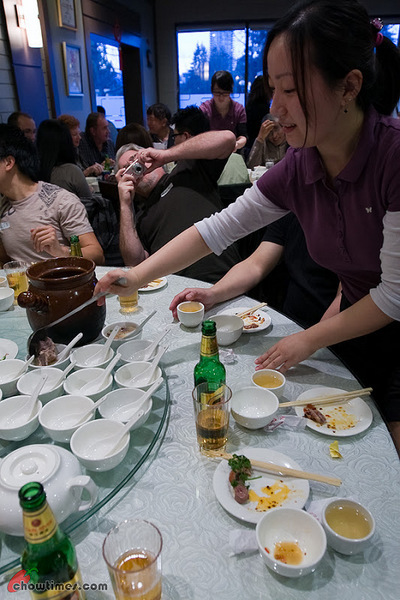 The kicker is this … all the 14 dishes and 4 appetizers costs only $20. The kickest is this … the $20 included tips and taxes! That was too much food, to tell the truth. Towards the end of the dinner, most people could hardly take another bite! Zhujiang Beer was kind enough to part sponsor the beer for the evening. 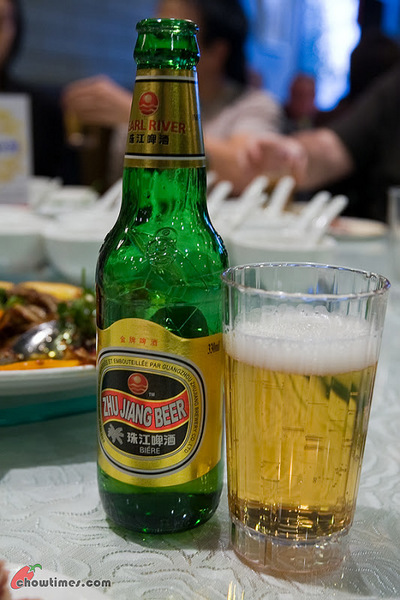 I had never had Zhujiang Beer before. It looked deceptively clear and almost like Chinese tea if not for the foam. It has quite a punch too with 5.3% alcohol content … well, for me anyway. That evening I did not feel my face was flushed red. That was because it was all red the entire day from the adrenaline. A few words from me and fmed kicked off the first in the series of 8GTCC dinners. Fmed and his team is really the people behind the dinner. With fmed as the lead, the team was the one who did all the research on the Hunan cuisine — a very impressive piece of work I must say. Fmed and the team were also instrumental in the selection of the restaurant (very good choice!) and the dishes (overwhelming choices!). I was glad everyone turned up … on the dot! The 8GTCC team was expecting that some people might not turn up so that we can pass the seat to those on the standby list. But no … everyone turned up. A couple even drove all the way from Kamloops for this dinner. It was great to meet all the people who reads chowtimes. Frankly, I was kind of overwhelmed that night. I did not manage to chat with many of you because there was just so many things going on. Suanne said that I was a mess and was fidgety. LOL! The dinner started with appetizers. Appetizers in the Chinese cuisine are not like western appetizers where it is a course by itself. Appetizers are quick serve items that is prepared upfront and served to the customers while waiting for the kitchen to cook the rest of the meal. It was something to munch on and chat over. The above appetizers are Hunan Pickles and Spicy Dried Bean Stick with Celery. An excellent start to the dinner. Each of the appetizers is $5 but Ivy loaded up the plate so that “everyone had a bite”. There were more than enough for “a bite”. Throughout that night, Ivy came by a few times telling me that she is adding more of this and that. So thanks a lot Ivy for all these extras so that everyone has a good time! The next couple of appetizers are Spicy Pork Ear and Pork Heart with Five Spices. The Pork Heart (the one on the left) is the one that won GOLD award for appetizers. You should try this and see for yourself what the fuss is about. I like it … it is slightly chewy, and of course spicy. Talking about spiciness, we were bouncing to and fro on what level of spiciness we should have for this dinner. Personally, I would like it to be exactly the way it should be in the Hunan cuisine — really, really spicy. But sanity prevailed. We ended having the dishes mild and medium spicy. It was no kick for me but I am glad we did it medium/mild so that everyone can enjoy it without the extreme pain. The soup was complimentary from Alvin Garden. We wanted a simpler soup but Ivy insisted that we take this soup because it is more elaborately prepared. It take the kitchen 3 hours to make this. There were lots of stuff in it that I cannot remember what they are. There is certainly lots of pork (with bones). Oh yeah … I wanted to say something about the bones in some of the dishes. 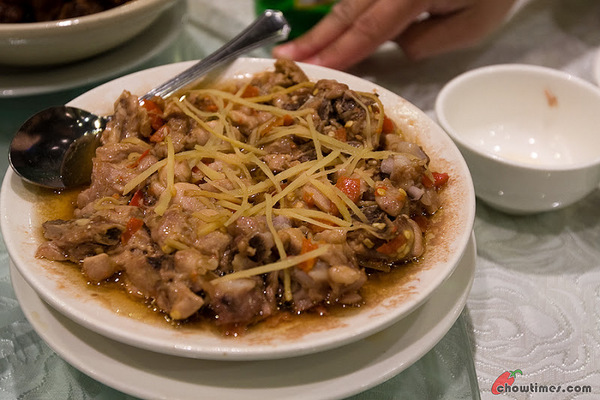 Hunan cuisine (or for that matter Chinese cuisine in general) does prepare the meat dishes with the bones intact. It actually tastes better but it is also a hassle and messy affair. I was a bit concerned for the non-Asian folks who are not used to it. So yeah … there were a lot of bone fragments on the side plates. 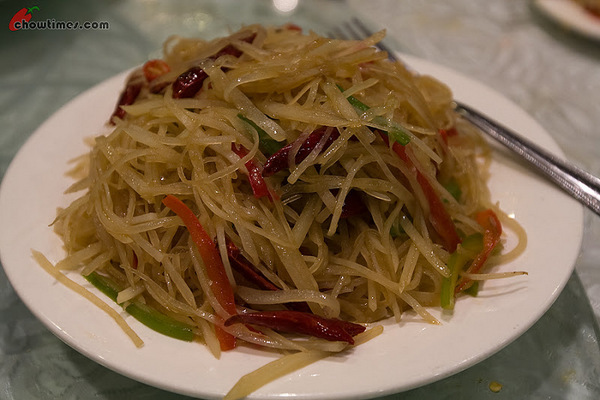 Not all Chinese cuisine are like that though but this is the way it is for the Hunan cuisine. 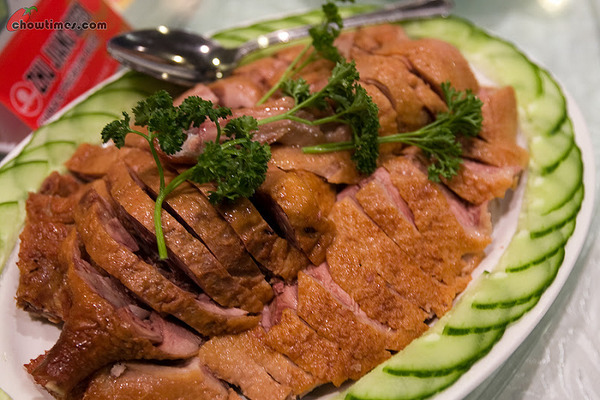 The Tea-Smoked Duck is a must have in Alvin Garden. This dish above won SILVER in the Duck category. Never had this before and it turned out much better than I expected. Just lovely. I like the meatiness of this dish. On the menu, this is $19 and is categorized as an appetizer. But I think this is because this is prepared ahead and they just chop it up before serving … hence the categorization of this as an appetizer. You … must … try … this. 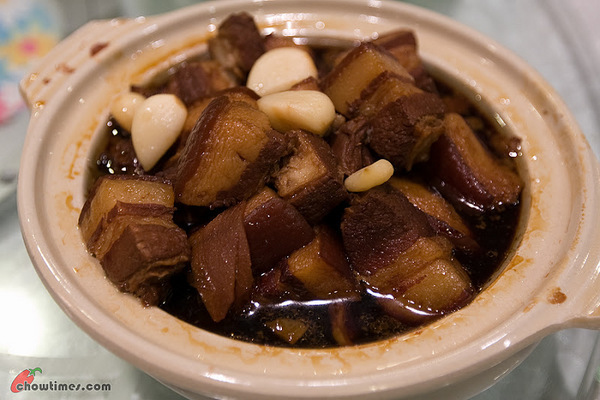 The above is called Hunan Braised Pork. Everyone in China knows this as Mao Tsetung’s favourite dish. A lot of people tells me that he eats this everyday. Mao calls this his brain food. So, I guess it is this dish that shaped China in the last century. It is very fatty. You have to have this with the layer of fat … at least 50% of it must be fat. Although it is not for everyone, you still have to try this. The reason is because Mao said that this makes the men … smarter and the women more beautiful. 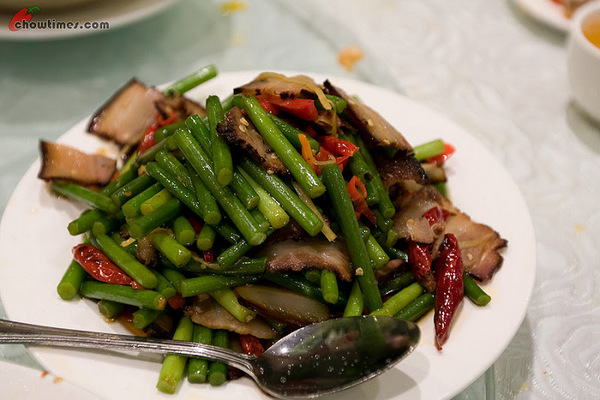 Moreover, you cannot say you had really tasted Hunan cuisine without having this dish. It is like saying you had American food without trying a Big Mac. Good analogy? Anyway for the ladies who attended the dinner, have you checked the mirror after the dinner? The above is fmed’s favourite dish. So it is worth the mention. He raves about this all the time and I mean ALL the time. Everytime we had this, he goes into describing how wonderful this dish is. So, I am going to leave it to him to describe it for you all. 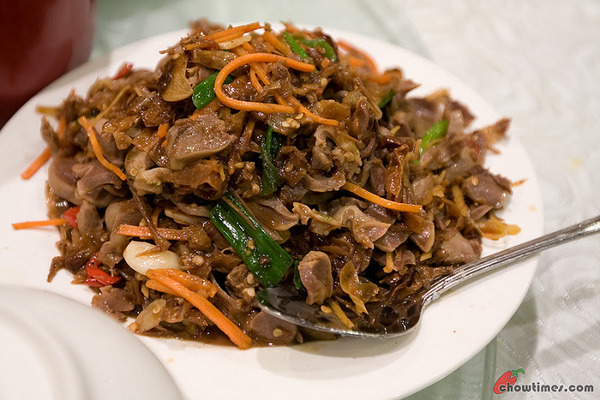 This is called Stir Fried Garlic Bolt with Hunan Smoked Pork ($13). This is a double whammy kind of dish — smoked pork and garlic bolt — two superb combination. Ivy claims that you can only get this above in Alvin Garden in the whole of Metro Vancouver. The unique ingredient is the ultra-spicy Hunan white chili. You like pain, like extreme pain? You got it in this dish. It is stirred fried with Chicken Giblets. If you don’t know what giblets are, don’t ask. Just imagine it to be chicken. But really, you will love the texture and the kick. I like the Spicy and Sour Potato Shred too. At a glance, you would not think this is potato at all. What really strikes me is that this Hunan specialty is made with two major ingredients not native to China — potatoes and chili. Both of these ingredients are from South America. 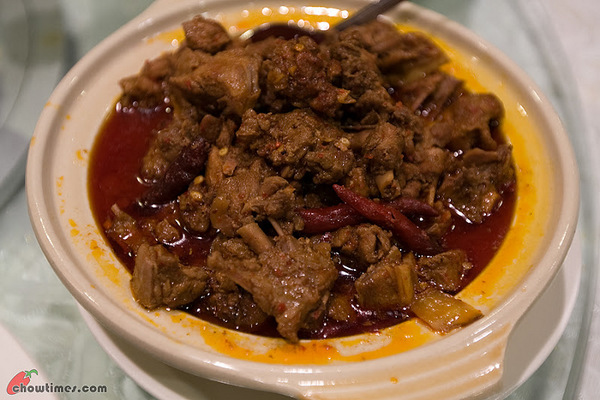 The above is Free Run Chicken with Ginger … or … is it Chicken with Hunan Chili and vinegar? Or is this Free Run Chicken with Ginger? Frankly, at some point I lost track of the dishes. There were so many good stuff that we did not care so much. Yeah, we were quite confused with what is what. The above is Donting Boiled fish in chili soup ($19). There were fish fillet (what fish is that? … anyone?). We scooped the bowl clean of the fish leaving only the soup. I forgot to ask that they give the remaining soup for us to take home. 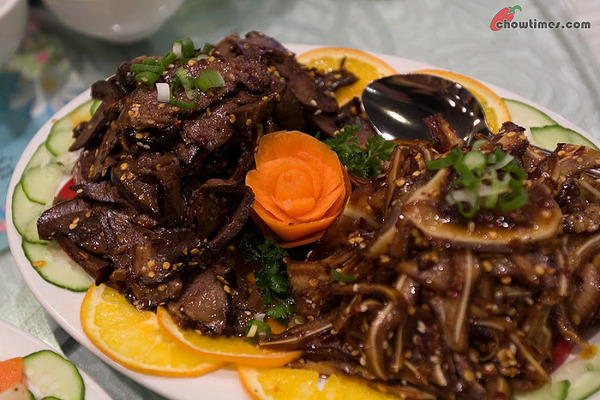 The Duck Braised in Beer is one dish you will commonly find in Hunan cuisine. I had this dish many times before and at no time did I detect any beer in it. Maybe it is not beer that we know of that is used here … maybe the cooking evaporated the beer which kind of defeats the purpose of the beer in this dish. But it is delicious. It also has lots of sharp bones that I was kind of wondering what the non-Asians think of this dish. I bet they will say that it is a lot of work for so little meat. Is that right guys? LOL! The Steam Ling Cod Head ($19) was another dish that is a lot of work. Just be warned that has a lot of bones. What is this dish guys? I can’t figure out what this is. But this one I know. This is the Stir Fried Lamb with Cumin ($13). While you won’t go wrong with this dish but for me, the bestest Lamb with Cumin is from S&W Pepper House in Crystal Mall. 7 times out of 10, I order this dish when I eat at S&W Pepper House. Douglas from the Golden Great Wall Szechuan Restaurant sponsored the dessert when he found out that our menu does not include a dessert. 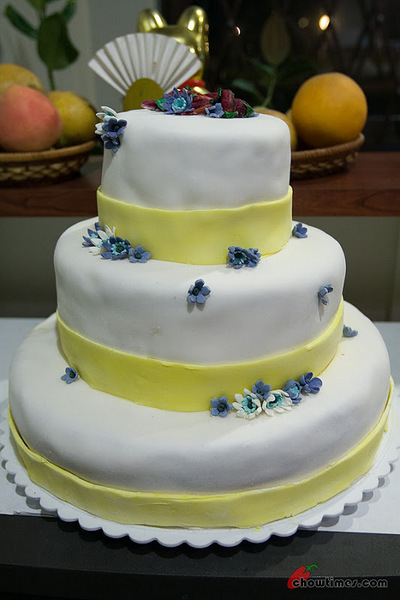 The 3 tier cake was made by Gaya, their baker and pastry chef. Thanks a lot Douglas. This is very much appreciated! The TV crew was there to cover the dinner. 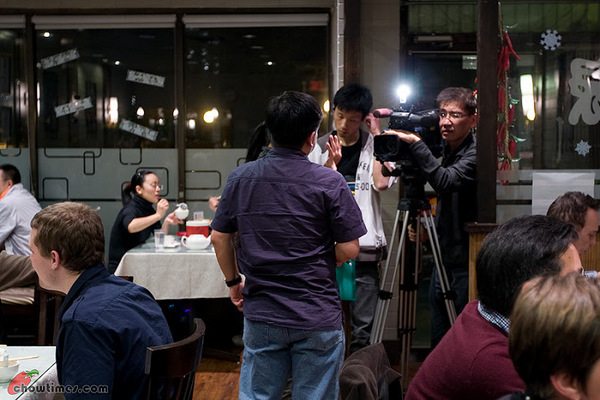 They interviewed a few of the diners and got me to say a few words at the end. Oh gosh, I absolutely hate to see myself on photos let alone on TV. So on behalf of the entire 8GTCC team (fmed, Dylan, Joe, LotusRapper, Keev) I want to thank those present for taking the time to join the 8GTCC team in this discovery of the Hunan cuisine. Thanks a lot of the kind and encouraging words we received too. The 8GTCC team will start working on the next in the series. Exactly which cuisine, we have a rough idea but will let you know as soon as it is finalized. We learned a lot from this first dinner and you can bet that we are now better equipped to make the next one better. 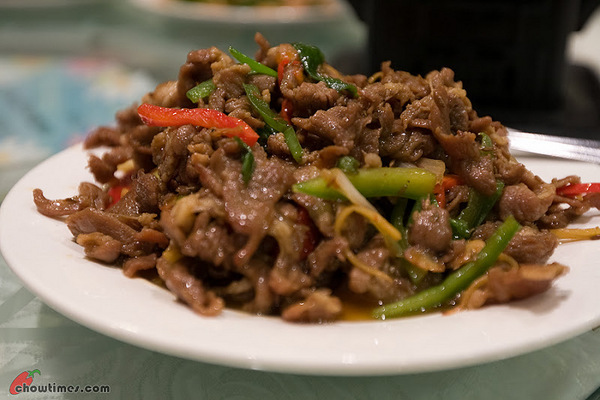 Stir Fried Garlic Bolt with Hunan Smoked Pork 12.98 or…. Wow! I was surfing and came across this blog and your idea of the Eight traditions. Great idea put into action. You know there are goverment support programs for publishing books,If you want,I could send you information on that privately.Go for it!!!!!!! Congrats Ben & Suanne, you’re really taking this food blogging into a whole new level. which channel will u guys be on and what date..would like to watch on tv. Looking forward to the next one now. My mouth started watering when I read your blog. It looks like a success. Looking forward to seeing this on TV. Will you send a notice out as to when and where it is airing? Well Maxmillian and iPanda: If I like how I look on the TV, I will most definitely let everyone know when the show is broadcasted. If not, I’ll keep quiet and let this just be another embarrassing episode in my life. You understand, don’t you? LOL! Congratulations on making it through one very busy day! Looks like a great success. I still think you should turn the 8 Cuisines idea into a book or public television show. You could be the Ken Burns of BC. LOL! Ken Burns of BC? I don’t even know who he is. He he he … that would be nice to have a TV show called chowtimes (actually there once was a TV show called chowtime without the s!) but seriously, I don’t even entertain that thought. I am just happy being who I am and organizing dinners for people is about what I want to do. I don’t want to let this blog engulf my life. There are still other priorities I know I must protect. Chowtimes must always remain a hobby for me. Sorry for the rambling. If you “sold out” your dinner in a short time just to people in BC, there is obviously an audience for specific information about your subject, the Eight Great T. of C. C.
If you (or someone you approve of) puts together a book or television show, you will be able to get this information to exponentially more people. That way a lot more people learn about your subject, and people will continue to buy and read your material for years. Each time someone buys or watches, you and your team make a little money, since you put it together. Your blog is the comet’s tail of readers or watchers you bring to the project. Your assembled readership is truly an asset that you could bring to a project. Whether or not you want to do the project, you have the asset. There are many, many more people interested in your subject than can attend a physical dinner. You could have something big here! By helping to inform the rest of western civilization about the 8 Great T. of C. C., you increase cultural awareness to a degree unknown before. It is a great opportunity, not to be dismissed lightly even if writing a book or producing a show isn’t “in your wheelhouse”. It IS in other people’s — all you have to do is make the arrangement. So take good notes on all you learn, and think about it! OK, OK etranger. 🙂 You are right. I have thought about what you said and have an idea on how to take the 8GTCC to the next level. I will put out a proposal to the team to create a book — together with RECIPES! I don’t expect to sell a lot of the books but it will be more of a vanity project (at this time!). Awesome, if you know the exact date and channel, please let us know. Looking forward to seeing that. One thing you gotta love Chinese restaurants is that there are always opportunities for them to give you so much stuffs hahaha! I liked the Hunan Pickles and the Spicy Pig’s Heart the best among those four. But, I think maybe it was the Smoked Duck that was the best dish of the night. That duck was just fantastic. Besides the duck, my other favorites were the Potato Shreds (I always love this dish! 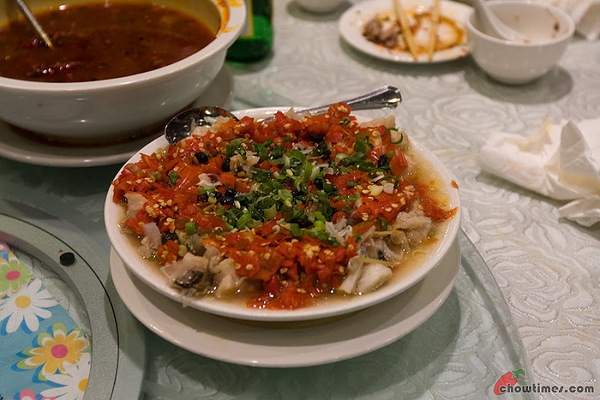 ), the Garlic Bolts with Hunan Bacon, and the Water-Boiled Fish (Boiled Fish in Chili Soup). The Braised Pork Belly was just “OK” for me, nothing special. I guess I won’t be getting pretty! LOL. 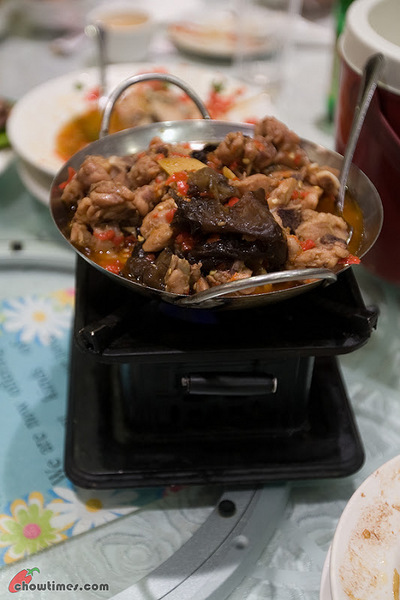 Your first picture is the Chicken with Ginger, I believe, because it’s in a “hotpot”. Then the 2nd chicken picture is the Chicken w/ Chili and Vinegar. 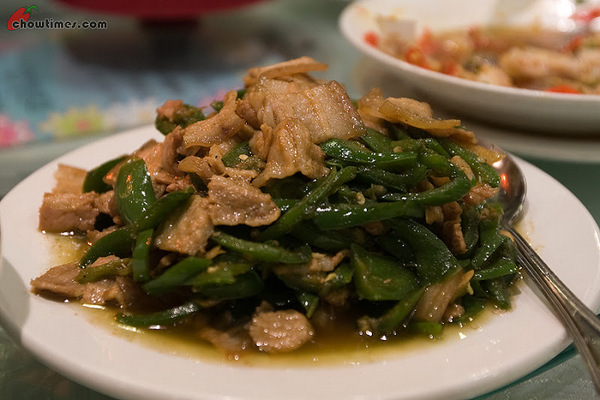 The “unknown” dish you have above is the Sliced Pork with Green Chilis/Peppers. You mean DESSERT as opposed to APPETIZER in the paragraph about the cake. Thanks for linking to us! Actually we made the Hunan Braised Pork and are about to post it up! We also made Water-Boiled Beef too. I’ll comment to let people know the URL once it’s done. Thanks for organizing the dinner and see you at the next one. Sounds like a blast! Can’t wait to see what the next one will be! I’m so jealous I could not go but definitely will think of Alvin Gardens when I want to try sometime different than Cantonese. PS. If you take a vitamin e capsule before eating spicy food it kind of buffers the intestines so it’s not so painful the next day! Thank you Ben and the rest of the 8GTCC gang for putting this together! We had a great time sharing great food with great people who have the same love of good food! I really liked the Tea Smoked Duck the most, although the Braised Pork Belly runs closely behind…haha. Didn’t know that the gizzards had the most lethal chili in it, but it explains why my mouth was burning like crazy afterwards! Awesome job guys!